Here is where I tell you that it is NOT a cold, but rather ALLERGIES. To which I say, pshaw. 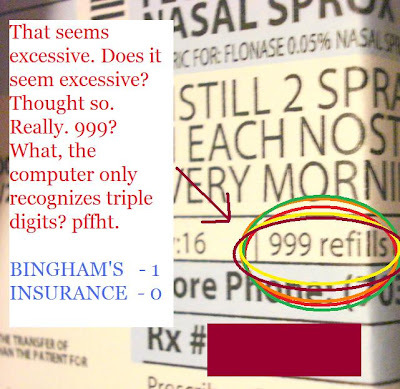 Just because, you know, it's rather convenient that 6 of us would have allergy problems at the same time, right? Yeah. That's what I thought too. And really. 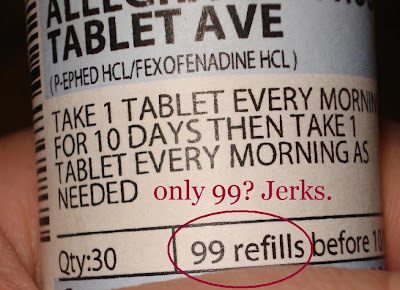 only 99 refills? I totally feel gipped* KNOWING I could have been sitting pretty at 999. I mean, if you're gonna go big, go BIG. *Dudes, there's like NO WRONG WAY to spell gipped, jipped**, gypped, it's all GOLDEN. I'm pretty sure I'm not okay with that but in my current head fog I don't think I should contact the dictionary company just yet. **Upon further research, it's just so commonly misspelled that it's now just an actual spelling instead of mis-spelling. ****Okay, not really. Sheesh. Put down your torch and pitchforks.